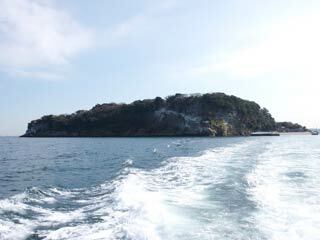 Sarushima Island (猿島) is located 1.7km off the coast of Yokosuka and is the only natural island that remains in the Tokyo Bay. Precious ecosystems, animals and plants abide in the deserted island that spreads on an area of pprox. 5.1 ha. Historical monuments, including ruins of the Jomon and Yayoi periods and fortresses from Edo, Meiji and Showa period still stand today, making the island a true wonderland abundant of natural and historical treasures. Sarushima Island boasts itself for all its great resources making it a natural open-air museum that is 'Eco-museum' Sarushima. 2. take a boat at Mikasa Port. Natural and historical resources on Sarushima Island are precious and historical treasures. Please keep the following rules to help to preserved the resources for future generations. Thank you. - Do not vandalize precious historical monuments. - Take your garbage with you, not to pollute the island. - Keep out from the restricted areas and danger zones. - No entry or stay on the island at night. - Barbecue is only permitted in designated areas on the beach. - No open fire allowed. - The entry to the island is restricted to the Sarushima Island Ferry only. - Confirm the schedule of the last return ferry and be cautious not to be late for it. The top of the plateau and steep slope are covered by dense evergreen woodlands and the forest floor is also covered by various plants. One of the characteristics of the island is that there are three types of shores: the rocky shore, the sandy beach and the boulder stone shore. A large diversity of living creatures such as birds, insects, fishes and shells inhabit these locations creating a rich natural environment.